Dogs vary in size and physique and there is no set size for each breed and measuring is not always so easy . The following information is a guide to help you to measure for Hide and Collars items. Neck measurements for a traditional flat buckle collar, should be taken with a soft tape measure, middle of the neck and place two fingers between the measure and the neck (not slack). With smaller dogs and a fine coat, one finger should be sufficient. Do not be tempted to add, as you can see in the picture the tape is not slack. This is the size to order and this will be the middle hole on the collar.There will be holes on either side for adjustment. Be sure to mention if your dog is young and still growing and I can make allowance for growth. If you have a collar that fits your dog well, you can lay this out flat and measure from the buckle (where the leather sits around the buckle) to the hole you fasten the collar on, this is a good guide for me to work from. For Adjustable half checks collars, measure under the chin,behind the ears and a firm measurement is needed close to the skin. Do not place any fingers under the tape or add on to this measurement. The measurement given will be length of the leather section of the collar (mid adjustment) the chain adds 11cm(4″) allowing room for the collar to go over the dogs head and to give the checking action. Be sure to mention if young dog with growing to do. For Show set half checks take the measurement up under the chin, behind the ears and quite firm, so as not to come over the head. This will be the length of the leather section of the collar. The chain adding 11cm (4″) to allow the collar over the dogs head and to check. For Slip collars take the measurement around the widest point of the dogs head, around and over the ears, as these collars slip on over the head. Then add on 8cm (3″) for the collar to slip comfortably over the dog’s head and have a tag end with ring for the lead to clip onto. For Round ID collars These collars slip over the head and sit nicely at the base of the neck. The measurement to take is around the widest point of the dogs head, around and over the ears, the slide this down and if it is sitting comfortably where you would like it to, then this is the size to order. You don’t want it too loose. For Braided Kangaroo ID Collars This style of collar clips together so the measurement needs to be taken mid to base of neck where you would like the collar to sit, not too loose that it would slip over the dogs head. 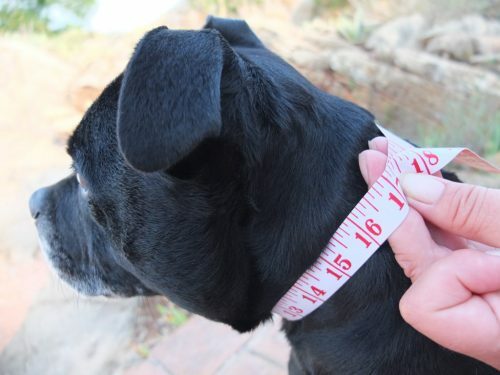 The measurement given is the total length of the ID collar.